Who wouldn’t want to read a book with this title? I am guilty of judging a book by its title (the cover is pretty nice, too), but the good news is that it paid off. I have spent very little time in my life thinking about Harpo Marx . Who would have thought to write him in as an integral part of a novel? Especially one set in Canada? But, Alexis Von Konigslow did it, and quite successfully. I found myself wanting to know more about the Marx brothers and where her story fell into the timeline of their lives. The book is made up of short chapters that alternate between 2003 and 1933. In 2003, Emily is writing about connectivity for her master’s thesis in mathematics, and has come to her family’s lodge to discover more about her past to use in her work. But, she finds herself getting side-tracked and lost in the confusion of the different stories she is hearing. She is having trouble getting straight answers out of her relatives. Is it because they don’t want her to know, or is their past as much of a mystery to them as it is to Emily? What is really going on? And, what does Harpo Marx have to do with it? Maybe secrets were secrets precisely because nobody should know them. In 1933, Harpo Marx and his brothers are visiting the lodge in Kingston, Ontario; the only place around for Jews. It was a happening place in those days – lots of guests, parties every night. But, this time around, Harpo is thinking a lot about his life, his career, and his deceased parents instead of joining in the festivities. Meeting Ayala and her daughters has him thinking about getting married and having a family of his own. He forms a bond with the older daughter, Blima (Emily’s grandmother at the age of 9), and soon finds out that there are hidden secrets and lost letters. He wants to try to help this family, but how? The alternating timelines that begin to echo one another. Harpo and his brothers goofing around. The feeling of place and family. The incorporation of historical details. Getting a child’s view of the adult world through Blima. Sam, Ayala’s husband and Blima’s father. The family members trying to figure out the ‘science’ of love. The playfulness of the narrative. This is a story about family secrets, the complexities of love, and the way our lives interconnect with each other, sometimes in unexpected ways. Even though I had the secrets mostly worked out by the end of the book, it was still interesting to read about how it all played out within the family. And, there was still one unexpected event at the end that seemed very fitting. God gave us a selective memory… and an imagination, and with those gifts comes the ability to remember things any way we want… And with that comes the capacity for infinite happiness. I first read about this book on All Lit Up’s First Fiction Fridays. Kerry from Pickle Me This met the author at her local library’s baby time, and has also written a lovely review of it. 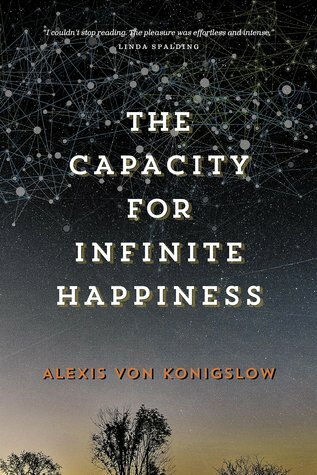 This is Alexis Von Konigslow‘s debut novel, and I look forward to seeing what she comes up with next. *Thank you to Wolsak and Wynn for sending me a copy of this book in exchange for an honest review. I’m a sucker for good stories about family secrets. I’ll add this one to my too-read pile. Thanks, Naomi. Yay! It’s not dark and disturbing like a lot of books about family secrets. And, they are not hard to guess at, but it’s fun watching the characters trying to figure it all out for themselves. The one word I would use to describe this book is ‘playful’. You have convinced me! It’s on my TBR list now! Nice review! I like your list! I often give thought to Harpo Marx. He is, after all, one of my muses. I am not saying which. If I started stating my preferences on which muse I liked the best, let’s just say a certain place would break loose and we wouldn’t want that. I had never given thought to him at all, but since reading the book, I’ve googled a few clips on you-tube. And, he’s funny! He did give Groucho a run for his money. He was on I Love Lucy a number of times. The stories of him off camera reveal what a wonderful person he was. I think he was in something with Marcel Marceau too. Get some of the Marx Brothers films. They were amazing. It sounds like I should! Maybe the kids will like them, too. What an unusual idea. Harpo was always my favorite Marx brother. He was Emily’s favourite, too. The book made me want to read his autobiography. This sounds like an entertaining book, and since you mention a good ending, it’s probably a feel-good book as well (except for the discrimination against Jews). While I don’t know enough and haven’t watched enough Marx Brothers to consider myself a fan, I am still intrigued. It’s on my list now. Yes, I think I would describe it as a feel-good book. And, I think I mentioned before in another comment that ‘playful’ is a good word for the style of the story and her writing. Oh this sounds great, and Harpo Marx?? Hooray! Funny, that sounds like my family. You can’t get a straight answer or a consistent story out of anyone, so I don’t bother asking anymore. I love the idea of the Marx Brothers goofing around in Ontario and would read the book for that alone.